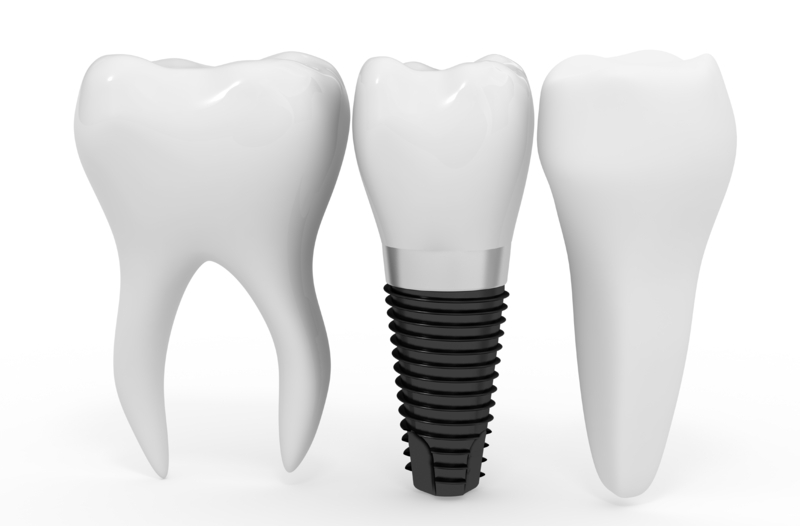 Dental implants are single replacements for missing teeth. They are usually made of titanium or other biocompatible materials so that bone will grow in and around them to lock them into place. Why is it important to replace a missing or extracted tooth with an implant? Your teeth work as a group to do many things like chew food, form phonetics for proper speech, and fill out your cheeks to maintain a youthful appearance. Posterior teeth serve to support the force of your bite, while anterior teeth allow for proper chewing and beautiful aesthetics. Losing a tooth means that the remaining teeth have to absorb more force than what they were designed for. Because the number and distribution of teeth changes, but the force with which your muscles contract does not. We often see that when people have been missing a tooth or teeth for a few years, the remaining teeth break down much more quickly than they should. Therefore, it is important to replace missing or extracted teeth, and implants are the very best way to do that. Implants are threaded, and shaped like the root of a tooth. They are placed in the bone where a tooth is missing or was extracted. After a period of healing (usually a few months) in which your bone grows around the implant to make it strong, an anchor is placed inside the implant and a crown is made to fit your bite and match the shape and color of the rest of your teeth. As a restorative procedure, implants are one of the most successful treatments in dentistry. Although each one is different, generally accepted success rates are around 98% over the long term. This makes the actual effective value of an implant far outpace the cost to the patient. There are many factors that can decrease the chances of success, such as smoking, poor oral hygiene, and related health issues like diabetes or bruxism (tooth grinding) so it is important to discuss these factors with your doctor when considering implants as an option for teeth replacement. Does it hurt to have an implant placed? Rarely. Most patients report little to no discomfort after an implant is placed. Typically patients may use OTC pain medicine such as Advil or Tylenol with great success after surgery. How Do I Clean My Dental Implants at Home? 1. Use a soft or extra soft toothbrush and a low abrasive toothpaste (avoid pastes with gritty particles) and brush the entire mouth twice daily and especially thorough at night before bed. 2. Proxy brushes (non metal miniature pipe cleaners) can be used to brush the in-betweens of the teeth. A prescription antimicrobial mouth rinse may be prescribed if your dentist feels it appropriate based on your level of inflammation. 3. Wrap floss around the implant at the base of crown of the tooth in a figure eight formation and pull back and forth. It is completely safe to clean your implant at or below the gum line. In fact, it is most important to remove the biofilm from the junction of the crown and gum line. Do this every night after you have eaten your last meal. 4. A water pik is a wonderful adjunct to a home care regimen and is highly recommended for patients with implants. Strong water pressure forces the food particles and bacteria from the trough of gum surrounded the implant. This can be used morning and night. How Will I Care for My Dental Implants After Surgery? Pain and swelling are not expected following normal post surgical soreness, however rest will be important over the next 12 hours to help the body form a good blood clot at surgical site. The clot formation aids in reducing pain, bleeding, and the risk of infection so limit exercise, talking, chewing, and avoid smoking. Smoking slows healing and increases the risk of surgical complications and failures. Abstain from food and drink for one hour and use a warm salt water rinse every 4-6 hours. Food intake should be limited to liquids for the first 12 hours and then very soft foods for the next couple of weeks. Avoid seeds and nuts. Apply with chlorehexidine twice daily. Do not pull on sutures. There should not be any bleeding after 24 hours. Bone particles are not unusual at the graft site. If you’re interested in learning more about dental implants and replacing missing teeth, we would be happy to tell you more. Please call our office at 615-254-1393 for more information or to schedule a consultation with Dr. Clark.